If you’ve got a cat that’s anxious, scratches the furniture or engages in other unwanted behaviors like marking and spraying, you’ll want to check out Comfort Zone. It’s designed to mimic natural feline calming pheromones to reduce, or eliminate, stress-related behavior and according to the manufacturer, it’s clinically proven 95 percent effective. Comfort Zone makes a calming diffuser that plugs in to the wall and they are usually on the pricey side, but I just got a heads up that they are 71% Off right now at Amazon! Head on over and you can snag the Comfort Zone with Feliway Diffuser for Cats for $14.99 ($50.99 reg) plus read more about how it works. While it may not be the solution for every kitty, at $14.99 it’s certainly worth a shot if your feline friends shows signs of being anxious, has lost their appetite, or engages in destructive behaviors. Remember to always check with your veterinarian if your pet has a sudden loss of appetite, or changes in behavior. This can sometimes signal a health problem other than just moodiness or anxiety and only a medical professional can help you determine that. $24 for Original Anxiety Wrap for Dogs ($40 reg) w/ Free Shipping in 11 Sizes! If your dog gets anxious during thunderstorms, fireworks, suffers from nervous or shy behavior check this out! The Original Anxiety Wrap for Dogs is a comforting cloth wrap that applies gentle pressure to help calm dogs and prevent nervous or destructive behaviors. Right now, you can get the Original Anxiety Wrap for Dogs on sale for 40% Off. It’s just $24 including free shipping ($40 reg) and comes in 11 sizes so you are sure to find the right fit for your pup! Visit Groupon.com for this pet deal. As with most Groupon Goods deals, this one lasts only 3 days! FREE $2 Amazon MP3 Music Credit + 20 Songs for 25 Cents Each! Get Free Music for you and your dog with a FREE $2 Amazon MP3 Credit when you use Amazon Promo Code: HEARTMP3 by 7/23/201. You can use your $2 FREE Amazon Credit to snag SEVERAL FREE TUNES during the 20 Songs for 25 Cents Each promotion going on now at Amazon or use it for anything you like in the MP3 Store! Amazon MP3 downloads work on all devices including iPhone, iPod, Android and MP3 Players! Daisy also recommends downloading a couple of songs from Through A Dog’s Ear: Vol 1, Music To Calm Your Canine Companion . Great music, designed especially to calm anxious or nervous dogs! 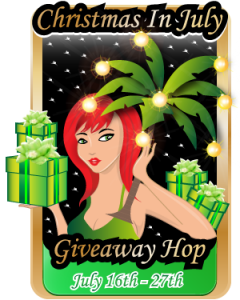 It’s time for Christmas in July, a spectacular giveaway event July 16-27, with chances to WIN all kinds of gifts and prizes! After you enter our giveaway here, be sure to check below for info on how to enter the Grand Prize Giveaway plus links to all the other participating blogs and giveaways for more chances to WIN! 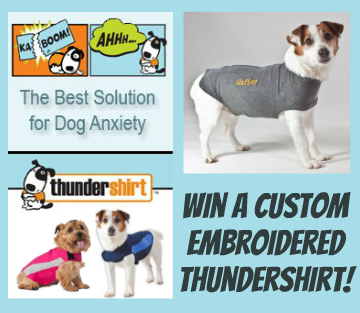 Our Giveaway is sponsored by Thundershirt the proven solution for dog anxiety and fear of thunderstorms and noises. 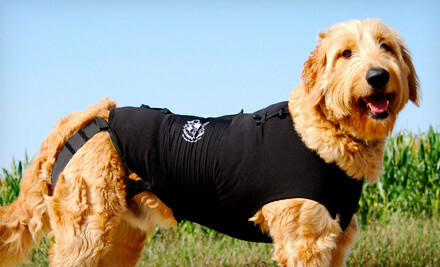 The Thundershirt is Daisy Tested and Approved and you can see Daisy wearing her Thundershirt here! For a quick intro if you are unfamiliar with Thundershirt, check out this video and get the scoop straight from a dog’s perspective! Not only will the lucky winner give their dog the gift of calm, but you’ll also get to choose your size, color and personalize your dog’s Thundershirt with their name custom-embroidered on the side! 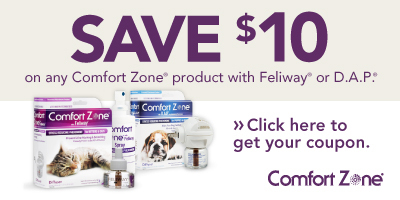 *HOT* $10 Off Comfort Zone Printable Coupon for Dogs and Cats! Do NOT wait to snag this super High-Value Pet Coupon for $10 Off any Comfort Zone Product for Dogs or Cats! Comfort Zone products help to relax stressed out or anxious dogs and also reduce unwanted behaviors in cats like spraying and scratching. $10 Off is the best coupon I’ve seen yet on Comfort Zone, which can be purchased at PetSmart and other pet supply stores. You can print this coupon now and then stack it with a Store Coupon for additional savings (I’ll post when the new ones are released for Petco and PetSmart)! When we first adopted Daisy she was very anxious and the behavioral consultant at the rescue shelter suggested that we try some products like this with D.A.P. (Dog Appeasing Pheromones) that soothe and comfort an animal by mimicking the natural chemicals and scents produced by mother animals. Comfort Zone is also recommended for separation anxiety and fear of noises like thunderstorms and fireworks! You can read more about Comfort Zone Pet Products here and then make sure to print the $10 Off Comfort Zone Coupon here before it’s gone!